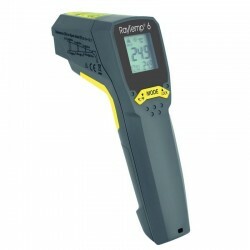 Simply aim and pull the trigger to display the temperature of the item being measured as long as the unit is at the correct distance which would be shown by the dots. Each RayTemp® 6 thermometer has eight dot circle laser indicator, which allows you to target the diameter of the area to be measured. As you move closer or further from the target the laser circle changes diameter. The RayTemp® 6 has an 12:1 optic ratio (target distance/diameter ratio) and features an adjustable emissivity which allows the user to measure a variety of surface types. The RayTemp® 6 infrared thermometer is housed in a robust IP54 splashproof case and features a three-button keypad, allowing the operator to choose °C/°F, display hold or one of the many mode options available, i.e. max, min, differential or average temperature.